Men can do their own thing in their man cave but what about us ladies? See some reasons why a she shed should be your next project! These days many of us love having our own spaces. Many families have a play room for the kids and a man cave in the basement for the guys to enjoy watching football and playing games. Heck, we even have a room dedicated to our cats for toys and trees! But, when it comes to us ladies, we don’t always have our own space. Sure, we often get our way when it comes to decorating and having a layout for the bedroom and kitchen, but they really aren’t a space just for ourselves because the whole family is usually using them too. That’s why I love that the idea of She Sheds have really caught on recently. Here in suburbia, many of us have sheds in our backyard for yard equipment or storage. Honestly, though, they often don’t get used that much and tend to look rather worn down. If your backyard shed has the same predicament, why not turn it into your own space by transforming it into a she shed? The whole idea behind a she shed is to have a space that’s all your own. Sure, other family members can visit if you like, but it’s a place to design, decorate and use as a sanctuary all your own for relaxation and rejuvenation. As caretakers of both family and friends, I think it’s super important for us to be able to take some time for ourselves to stay healthy (and sane). Having my own beverage station instead of being in the house and reaching for my favorite drink only to find someone else drank it? Yes, please! For me, the perfect she shed would be a place where I could go to open up a nice set of French doors to enjoy some fresh air while still having the comfort of being “indoors”. 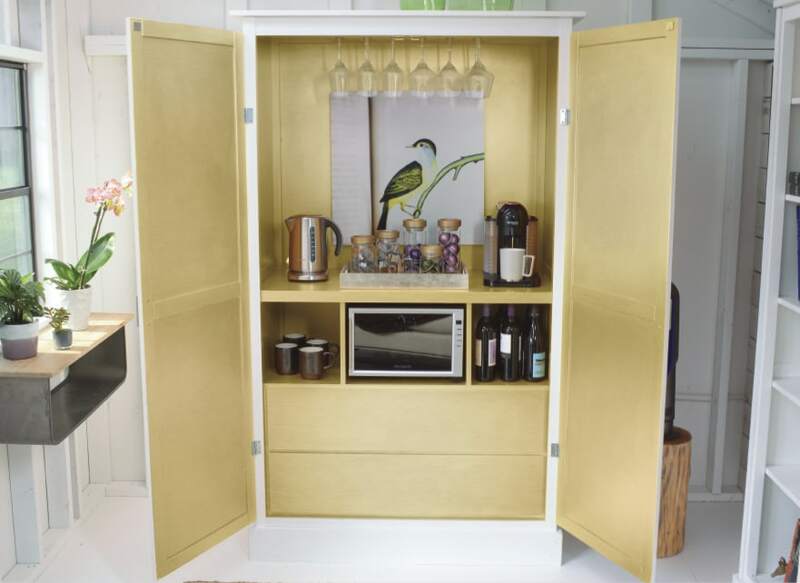 I’d also want a small beverage center to be able to enjoy iced tea, homemade sodas or something a little stronger when needed. It’d, of course, also have to have a nice internet connection so I could still check in and watch Netflix while having some time to myself. Luckily, Best Buy has beautiful solutions for all of these and more. Head over to Best Buy’s inspiration for 6 Tech Ideas for the Ultimate She Shed for ideas of how to be comfy and rejuvenate while using some of the latest tech. I’m totally in love with the cable decoration idea. How cool is this?! Would you ever invest in creating a she shed for your own personal space?